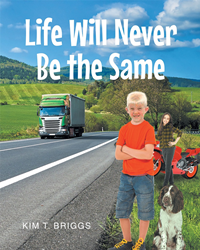 “Life Will Never Be the Same: Ginny’s Secret” from Christian Faith Publishing author Kim T. Briggs is the continuing story of a boy and his new neighbor, a not so ordinary girl named Ginny Kingsford. Young readers will enjoy the silly antics of Taffy, Bobby's dog, as well as the mysteries surrounding this quirky new family." “Life Will Never Be the Same: Ginny’s Secret”: a rollicking summer story for kids. “Life Will Never Be the Same: Ginny’s Secret” is the creation of published author Kim T. Briggs, a donut-loving, jigsaw-puzzling student of the Bible who reads widely and enjoys playing with her dog. Published by Christian Faith Publishing, Kim T. Briggs’s new book is a hugely entertaining glimpse into the never-sit-still world of childhood with its incessant curiosities, tried-and-tested friendships, and all sorts of misadventures. As the second book in the series, Briggs continues an imaginative world that mirrors enough of reality without the mundane bits to portray some interesting lessons about people, prejudice, and all-accepting friendship. View a synopsis of “Life Will Never Be the Same: Ginny’s Secret” on YouTube. Consumers can purchase “Life Will Never Be the Same: Ginny’s Secret” at traditional brick & mortar bookstores, or online at Amazon.com, Apple iTunes store, or Barnes and Noble. For additional information or inquiries about “Life Will Never Be the Same: Ginny’s Secret”, contact the Christian Faith Publishing media department at 866-554-0919.